Cars, buses, trains. These methods of transportation have absolutely no role in the normal state of Club Penguin island (except the truck in the mini-game, Bean Counters!). There isn’t any need for them. We penguins already get around the island by waddling on foot or simple shortcuts like the map or EPF spy phone. Just press a button and in the blink of an eye, you’re already at your destination! Sure, getting from point A to B on the island is quick and easy, but like some say, getting there is half the fun. During parties and events, Club Penguin made sure that we got to experience transportation on the island, regardless of the presence of maps and EPF spy phones. Didn’t have a car? No problem! Get a motorcycle! In August of 2013, we could hop on the highway and cruise on motorcycles during the Teen Beach Movie Summer Jam. All you had to do was wear the motorcycle item and when you hit the highway, it looks as if you are driving it. The highway is along the coast, so yes, while on your motorcycle, you had beautiful scenery: the ocean, sand, palm trees, etc. It’s like the coastal highway of California in Club Penguin! Fabulous, I know right? 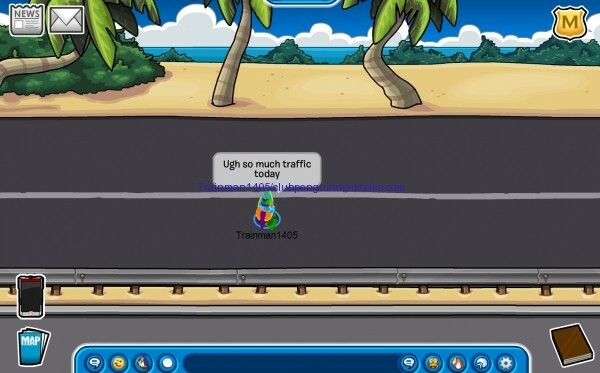 Additionally, Club Penguin included several key elements of a highway, like exits (you could exit to a room), overpasses, road signs, and overhead signs informing motorists of the next exit. It was thrilling to cruise on the majestic, sunny, gorgeous highway with fellow penguins. Who says penguins can’t ride motorcycles? Thanks to Trainman1405 at Club Penguin Memories for the photo. Last but definitely not least, during the Hollywood Party of 2013 and the SoundStudio Party of 2015, we got to ride in not just any ordinary automobile, but a limousine! Swanky way to travel around Club Penguin, no? At the Hollywood Party, penguins stepped in the humongous limo and partied. It even has a pool! It drove to and fro the party rooms. We entered the limo in one room and could choose to exit in another room when it arrives there. The SoundStudio Party brought the limo back, but in an unexciting state; it doesn’t actually take you anywhere like the Hollywood Party. As you can see in the below photo, the limo is unrealistically huge, but hey, imaginary stuff and creativity is everywhere in Club Penguin. I love it when Club Penguin intensifies their parties with modes of transportation. “Maps and EPF spy phones to get from place to place? Boring! Let’s ride a train instead,” what would be said during the 2013 Holiday Party. It’d be great if more transportation was present in Club Penguin, both during it’s normal and party conditions. Even though you probably know the island like the back of your hand, exploring it with a special method of transportation would be totally cool! You know the Snow Trekker (at first, it was called the Snow Cat), seen throughout Club Penguin and several of its parties? You can see a model of it in the Lighthouse. Anyway, it’s a no-nonsense vehicle that is built for the toughest terrain on Club Penguin island. Players with a Nintendo DS could drive and control the Snow Trekker in the wilds of Club Penguin in the DS game, Elite Penguin Force. We haven’t navigated the isle with the Snow Trekker online on the computer yet. Heck, perhaps one day, there will be a Snow Trekker game in the Club Penguin app or a completely separate app. Maybe someday, when Club Penguin decides to… would you like that to happen? The Snow Trekker has been seen in a few of CP’s events, like the 2009 Great Snow Maze. 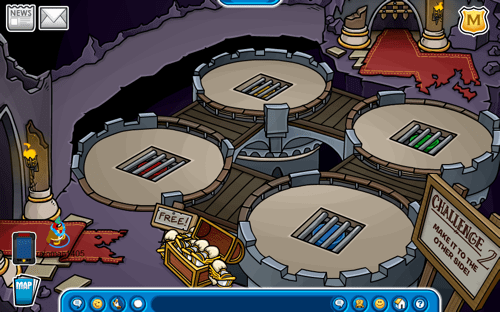 Some of Club Penguin’s best and monumental parties were the Medieval Parties. They were unlike any other party. They had their own charm and were simply fun. Those Knight’s Quests were the best part about them. Remember this room? I hope to see more epic puzzles like this in the future. This room was present at the 2011 and 2012 Medieval Parties. To view images of the 2011 party, which debuted the room, visit this page of Trainman1405’s blog. Idea for Club Penguin Mini-Games: Pause it! That relatable moment when you are playing a mini-game in Club Penguin, so close to earning a stamp, when something happens. Maybe your parents or siblings are calling for you or you have to use the restroom. You anxiously look around the screen for a pause button… when the realization hits you: a pause button doesn’t exist! Either delay the interruption and keep on playing or lose the game and the chance to earn your stamp. You wouldn’t want any of those to happen. The solution to this issue for mini-games is simple: just add a pause feature in them! That way, you can still take care of whatever just occurred to you while keeping the progress of the game. For example, I am so close to winning a stamp in Smoothie Smash and suddenly, I have to go to the bathroom! I pause the game, take care of it, and come back to the game without any loss in game progress. Pausing the game is perfect for fast-paced games, like Smoothie Smash and Jet Pack Adventure, and games that add up time being used, such as Puffle Launch and Puffle Roundup. I’ve only talked about the pros of the pause idea. Now, here’s the only known con: players can take a break from the game, relax, drink fruit punch, take a power nap, whatever, and come back to the game feeling relaxed and ready to play again. They play the game not all at once, but at separate times to make the gameplay easier. Perhaps only the games that require time should have the pause attribute? Club Penguin will decide on all the circumstances of pausing mini-games unless there’s a vote on their blog or fun stuff page that determines the details of pausing. Thanks to my good friend, Tommy58562, for bringing up this concern. The image in the tweet showing what the idea would look like was edited awfully (I am definitely not the best graphic designer in the field, ya know), but despite all that, it has been retweeted over 100 times. Who cares about how unprofessional the example graphic looks, many Club Penguin players like this idea and I thank you for the support! Even Spike Hike replied to my tweet of the pause idea! @Tech70CP I believe it is coming in the April update along with replay! However, he was not referring to the mini-games on the computer, but on the Club Penguin app. It’d be terrific to see replay with the pause on the computer too, but let’s put our main focus on the pause feature. Do you like the idea of having the ability to pause games or not? What are your thoughts of it? Share them in the comments below! How More People Can Come Online on Club Penguin with YOUR Help! Note that it would take a miracle for Club Penguin to be as crowded as it was in its heyday, but I don’t mean to be pessimistic at all. With the exceptions of servers such as Blizzard or Iceberg, Club Penguin servers are just like ghost towns. Waddling around the ghost town servers saddens me, especially strolling through the servers that at one point were full of players. Numerous servers lie in the server list, waiting for players to hop in. There are just too many of these servers and I personally think it’d be better to get rid of some instead of having a boatload of empty servers just sitting there. You, the players, can help Club Penguin! After all, that’s what Club Penguin is all about: the community, that’s us! We need to take action. I have explained some ways to bring Club Penguin’s popularity back! Well, it may not be a big enough impact to encourage people in the millions to join Club Penguin, but anything is advantageous. When Club Penguin was new to the world wide web, they got so popular, it was overwhelming. There was fear that the servers would crash because of the large amount of people online! Club Penguin got popular not because of advertisements, they didn’t do that kind of stuff. The reason was word of mouth. Friends told friends, “Hey, this game I’ve been playing is soooo awesome, you should check it out! It’s called Club Penguin and I think you’ll like it.” By spreading the word of CP, you are raising the chances of more new players joining. You can tell your family members, especially the younger ones, about Club Penguin. You can tell your friends, too, even though they might be older than the recommended age, but hey, lots of teens play Club Penguin. Creating fan blogs, videos, and artworks are more powerful ways to help Club Penguin. All of this content is merely optional, yet many members of the community are doing this for enjoyment as well as aiding CP. While we are doing any of those three, more Club Penguin media and content is being posted on the web and more people will get to become aware of a game with the name, Club Penguin. The more media, the more interaction with Club Penguin, thus comes more players as the media is being spread around the internet. Bloggers, video-makers, and artists, keep up the excellent work! Finally, in order for Club Penguin to see their stats of online players going skyward, you need to be online, needless to say! I try to keep a balance between Twitter and Club Penguin. Even though you completed everything in Club Penguin, the Card-Jitsu saga, stamps, etc, you can nonetheless keep on having fun by playing games and partying with friends. I have to admit, I tend to get bored on Club Penguin, even with some of CP’s parties lately, but once I play several extreme rounds of Card-Jitsu and have epic parties with friends, the ho-hum feeling vanishes. I may not spend as much time on Club Penguin than when I was new to the game, but I still have fun, typically with my friends! I completely understand that now that many of us are older, we are very busy with our lives. But when I have spare time, I use a portion of it for Club Penguin. 🙂 And I also keep in mind that mobile games and some computer games are tough competition for Club Penguin, so it is understandable that Club Penguin’s traffic has decreased. Even when you’re just online, doing nothing, that does help Club Penguin. Of course, memberships help Club Penguin even further, but with all the little help added together, it’ll mean an abundance of help for the game we’ve loved for years. The kinds of parties being hosted in Club Penguin are endless. You can even join in a Star Wars-meets-Frozen-kind-of-party, ya know. I would like to end my post about the well known hashtag, #SaveClubPenguin. If you are on Twitter, I assume you’ve seen it already. I personally believe that Club Penguin doesn’t need “saving,” because it’s not like the game will end next month. Club Penguin just needs some help from the community. Together, we are as mighty as the Tallest Mountain!